“As the name suggests, the Multi-Screen System provides highly visible images, resulting in extreme satisfaction without any concern about the jointed areas between the screens. It operates at the lowest brightness mode, which gives us ample visibility." Also, during the Kumamoto earthquake that occurred immediately after the system was installed, the department was also fortunate to be using the direct projection method, as the system operated completely free from problems. "We were able to display a variety of information simultaneously, such as helicopter images, which were highly effective in grasping the condition of the traffic network within the prefecture." A system that would withstand 24-hour operation 365 days a year, while offering efficient maintenance. High brightness, enabling clear display images even in a brightly lit room. Excellent visibility with narrow joints between screens. A wide viewing angle with clear, easy-to-see images from any part of the room. 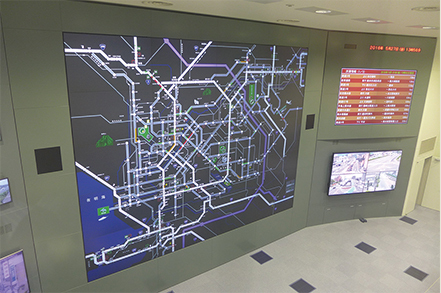 The traffic conditions of the entire Kumamoto region are displayed on the center screens. The screens at the upper right of the photo show congestion and other information in list format. 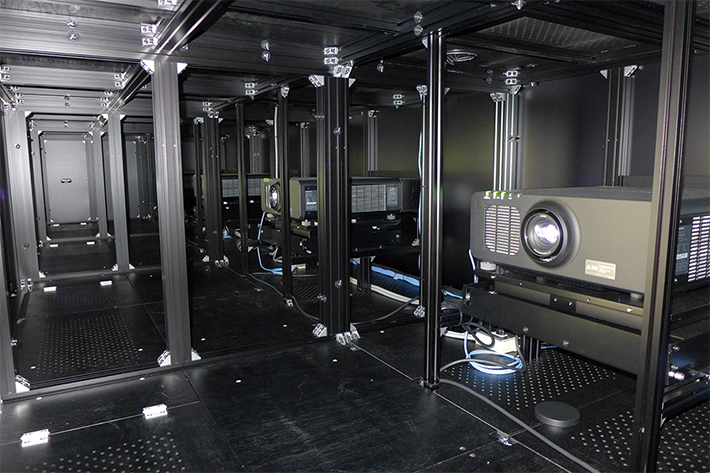 Four PT-RZ670 projectors are arranged in a line. There are five of these installed. The 72-inch 20-screen Multi-Screen Systems as viewed from the control desk. The images can be easily switched with the personal computer on the control desk. The Traffic Control Center condenses the traffic conditions of the entire Kumamoto prefecture into a single dimension, to enable constant comprehension and control, in order to provide the prefectural residents with a safe and comfortable traffic environment. in a line. There are five of these installed. 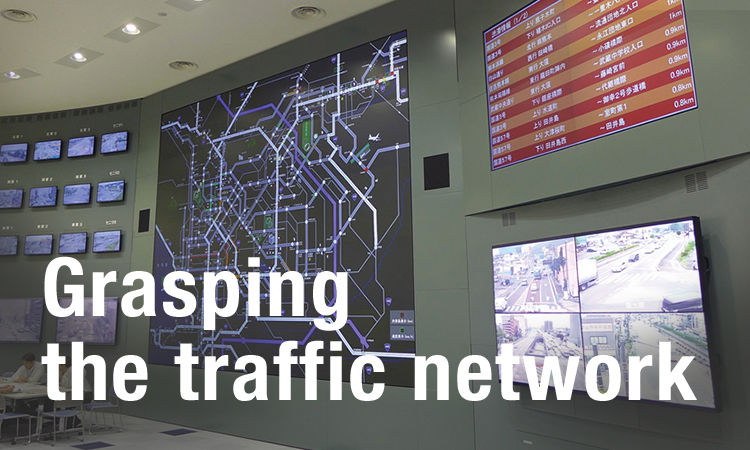 The Traffic Control Center of the Kumamoto Prefectural Police Headquarters condenses, monitors, and controls the ever-changing traffic conditions within the prefecture. The room has a high, vaulted ceiling, and a wall-mounted mosaic panel device was previously used. Since it became time to renew the display, it was decided to switch to a display that would use a laser-light projector. The two Multi-Screen Systems were configured with Panasonic PT-RZ670 1-Chip DLP™ Laser Projectors with ET-DLE055 Zoom Lens, twenty 72-inch displays, and four 65-inch isplays. 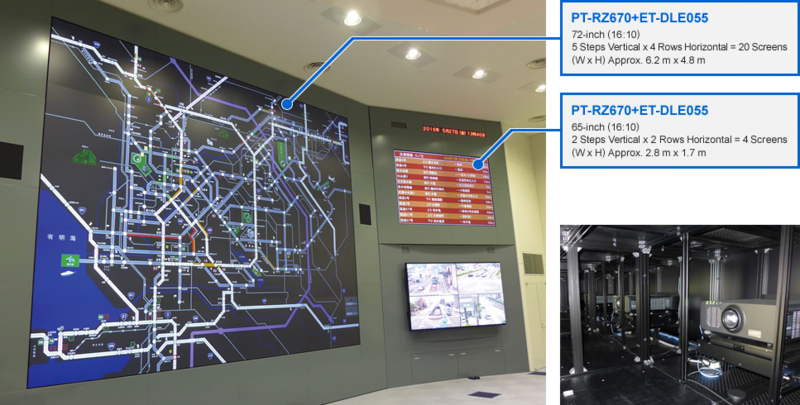 Since the two Multi-Screen Systems operate 24 hours a day, all day and all night, they are set to a mode that will allow approximately 10 years of operation. By using DLP™ Laser Projectors, maintenance work is reduced, which is also expected to help reduce running costs over the long-term. The system is operated in "Long-Life 3" mode, which produces the lowest level of brightness, providing ample display clarity even in a brightly lit room. The wide viewing angle also allows crisp, clear visibility of various information even from the edges of the room. windows of the upper floor. the personal computer on the control desk. Simple operation enables a variety of image data to be displayed on the installed systems. For example, during events, such as marathons, or natural disasters, such as earthquakes, images from helicopters and other related information sources can be simultaneously displayed in addition to the usual displays. This allows traffic conditions to be grasped quickly and precisely from a variety of angles. On the one hand, the system has the ability to instantly display diverse information, while also remaining easy to operate and configure. It is designed so that, in the event of an emergency, people other that technical specialists, such as ordinary staff and police officers, can use it. 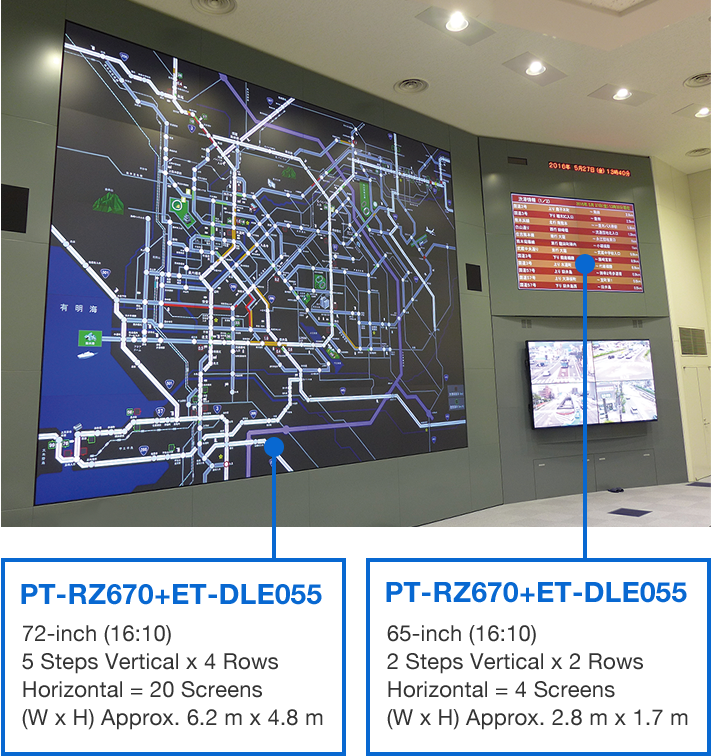 Together with upgrading the equipment by means of this renewal, the display systems were also connected to the building's network. As a result, the traffic conditions displayed at the Traffic Control Center can also be viewed on personal computers and other devices throughout the building. This enables information to be relayed more smoothly. 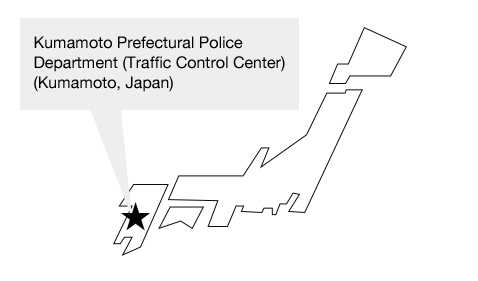 “Kumamoto Prefectural Police Department (Traffic ControlCenter)”Download PDF is here.